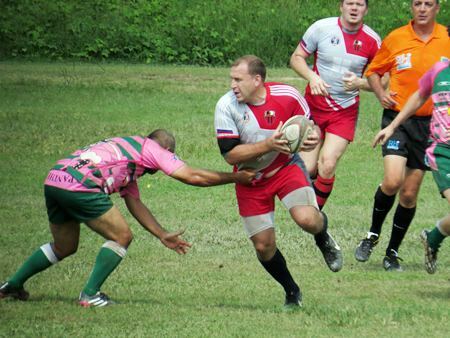 The 5th Chiang Mai International Rugby Tens saw two days of action on the field, here between the Siberian Journalists and Pattaya Panthers on Sunday, October 26, 2014 at the Prince Royal’s College. The fifth annual Chiang Mai International Rugby Tens was held at Prince Royal’s College on October 25 and 26, 2015 and saw a full complement of 10 teams play as well as separate women’s matches which saw five teams registered to play in a round robin format. The Chiang Mai Tigers are, of course local favorites, but visitors from around Thailand including Pattaya and Phayao, Malaysia, and Sri Lanka as well as returning favorites the Siberian Journalists Rugby Club took part in the popular event. The Royal Thai Air Force returned this year to defend their title, in all 10 teams competed over the weekend coming from Chiang Mai, Phayao, Chiang Rai, Pattaya and Russia. Referees came from Thailand, Spain and the UK. The Royal Thai Air Force took the Cup against the Chiang Mai Tigers with a 34-10 win while the second place Plate went to Chiang Rai who beat the Siberian Journalists 14 -10. The Bowl went to CMU Suan Dok who beat CMU Science 12 – 7. All funds raised by the tournament are donated to the Chiang Mai Tigers Rugby Club or are used to assist in the development of Rugby in the North of Thailand. Loose Cannons CC from Singapore and Centaurs CC from Hong Kong arrived in Chiang Mai as the guests of Prem International School Cricket Academy for an enjoyable two days of cricket. Both teams work for the same banking group in different countries. The Centaurs last toured Chiang Mai in 1982 with one of the players’ sons in the present side. The two touring teams played a 30-over match on the Saturday and the Centaurs batting first made 158 for 6 with all the Loose Cannon bowlers putting in good stints. The youngest of the party George Pollard returned the best figures of 2 for 22 after bowling with aggressive pace in his 4-over spell. The man of the match Keith Frith top scored with 37 as the lower middle-order also made useful contributions. Despite a fine 49 from Rob Hands, Keith Frith ripped out the middle-order with 3 wickets in the 14th over, reducing the Loose Cannons to 38 for 7, and the win was secured when Keith topped a remarkable performance with a hat-trick of stumpings to finish off the tail, as he produced match-winning figures of 7 for 18 from 6 overs, as Centaurs CC won by 32 runs. The Loose Cannons had chance to make amends on Sunday morning when the two sides faced each other again in a 15 over game. Once play was underway, the Loose Cannons batting this time came out with all guns blazing and Centaurs’ bowlers were smashed to all parts of the ground. A batting retirement at 30 runs was agreed beforehand and four players hit maximums resulting in a total of 169 for 5. The Centaurs’ response never got going and a rapid succession of wickets left the chasing side well short and they were skittled out for 71 in the 14th over to bring a satisfying win for the Loose Cannons by 98 runs. The weekend’s action concluded with an afternoon match between the Loose Cannons and Chiang Mai Lanna CC. The Loose Cannons clearly prefer short-format cricket as they continued in the same style with the bat as they had in the morning, reaching a total of 136 for 7 in their 15 overs, as Will Buck fired the shots with 63 runs from just 28 balls. The Lanna bowling attack stuck with left-armer Jun the best of the bowlers with one for 13 from 3 overs. Lanna were missing several frontline players but their reply was full of intent and the top three of Jason Bray, Basharat Wani and Brian Curtis hit the bad balls to the boundary to keep up with the required run-rate. The rising belief for a victory for the home side was dampened after Wani fell lbw to Por, a young Lamphun boy who played for Thailand U-16s, who was guesting for the Cannons. Once Chanchai fell for 14 Lanna’s resistance came to an end as they lost by a respectable 20 runs. It was apparent the players were soaking up the idyllic surroundings and it can be guaranteed that it won’t be another 32 years before the Centaurs tour here again, and the Loose Cannons had certainly found their range with some powerful hitting by the end of a fun-filled weekend which showed off cricket In Chiang Mai to its very best.